Jet’s IP Manager has a concept of ‘Base’ IP Ranges, and ‘Override’ IP Ranges. To add a new base IP range, use the form at the bottom of the IP Manager entry page. 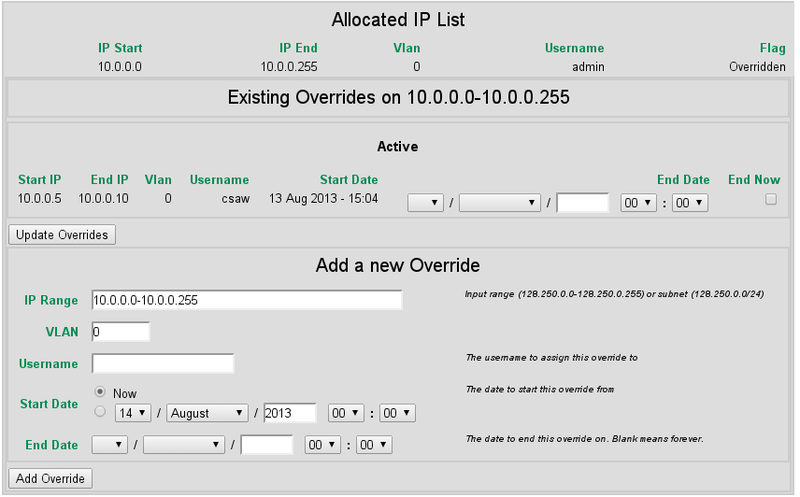 To add a new override IP range, either click ‘View Overrides’ at the top of the IP Manager entry page, or click an existing Allocation on the entry page and use the popup form. Adding overrides, as the name suggests, will override any existing base or override allocations until removed, or until their time expires. When they are removed, they will revert to their previous state. Figure 23 IP Manager Overrides popup.